Anyone who enters the front door of the west Lawrence home of David Brown and Mary Klayder quickly observes that holiday celebrations are a little different here. In the family’s music room just off the entry hall, careful hands have decorated a festive Christmas tree, strung with strands of twinkling, white lights and a glowing star on top. And behind it, on a wooden pedestal, someone has placed a big, modernistic welded-steel menorah, its tall, tapered candles waiting to be lit. To some, this tableau might be a jarring juxtaposition of clashing religious symbols — a Christmas tree for Christians, a menorah for Jews. But to this family, a seamless (well, almost) blending of two holiday traditions makes perfect sense. 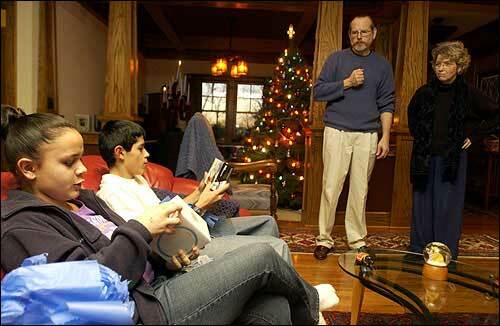 Each December, Brown, Klayder and their teenage children celebrate both Christmas and Hanukkah. That’s perhaps not so unusual. After all, interfaith marriages have become more common in America, with the result that families often face the “December dilemma” — whose religious tradition to honor, mom’s or dad’s. Many families — like Brown, Klayder and their children — have resolved a potentially thorny issue by observing aspects of the Christian and Jewish holidays this time of year. What is unusual is that neither Brown nor Klayder are Jewish. Brown is an avowed atheist. Klayder was raised a Christian. 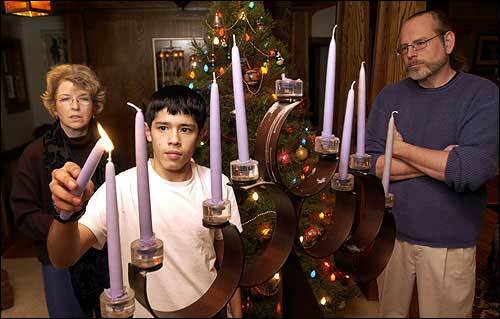 Tony Brown-Davis, 14, lights the first candle in the menorah with his parents, Mary Klayder and David Brown. The family, which practices traditions of Hanukkah and Christmas, began celebrating the Jewish festival Tuesday evening. So what’s with the menorah, the lighting of candles, gifts for the children and an annual feast of homemade potato pancakes? “The whole experience (of honoring Christmas and Hanukkah) is a celebration of who we are, how we blended together and how all the respective families are represented in this household,” Brown said. When Brown, 52, and Klayder, 54, met through mutual friends in February 1997, they immediately had something in common: Both had lost spouses in recent years. Klayder’s husband, Tom O’Donnell, an English professor at Kansas University, died in 1996 of Pick’s Disease, a degenerative neurological illness. Klayder and O’Donnell had been together 10 years, married for the last three of them. Liane Davis, Brown’s wife, died in 1995 of colon cancer. She had been a professor in KU’s School of Social Welfare from 1989 until her death. The couple were together 14 years. They adopted two children from Costa Rica, siblings Tony and Elia, in 1993. The children share the same last name, Brown-Davis. Brown, a Lawrence attorney practicing family law, and Klayder, a university honors lecturer in KU’s English department, married in January 1998. “David and I connected because we brought everything (from their earlier lives, including the loss of their spouses) with us. We had no desire to get rid of anything from the past,” Klayder said. That included the celebration of Hanukkah, because Brown’s previous spouse was Jewish. Davis, Brown and their children had always celebrated Hanukkah and Christmas. So when Brown and Klayder married, the family continued observing both holidays. Elia Brown-Davis, 16, left, and Tony Brown-Davis, 14, open their Hanukkah gifts as their parents, David Brown and Mary Klayder look on. At sunset Tuesday, the start of Hanukkah, the family lit the first candles on their menorah, a hand-crafted gift from Davis’ surviving sister, an artist. A few feet away stood the softly glowing Christmas tree. After the menorah was lit and the appropriate Hebrew blessings recited, the family carried on another important Hanukkah tradition: making potato pancakes, or latkes. Brown led the way as they transformed five pounds of potatoes, matzoh meal, onions and cooking oil into a deliciously greasy feast, served with apple sauce and dabs of sour cream. During the meal preparation, the children’s attention was eventually lured away by their gifts: Tony received a Nintendo DS hand-held video game system; Elia got an iPod Mini mp3 player. This was how Brown, Davis and the children had celebrated Hanukkah while she was alive. The potato pancake recipe the family followed — and continues to use — is hers, handed down from her father, Leon Davis, who died in 1992. “(It was) just the same way we do it today, with big, latke parties,” Brown said. Tuesday, Tony seemed happy that his family continues to celebrate both the Jewish and Christian holidays that arrive in December. “I like it. I’m always the first one up at Christmas — by about three or four hours. Now I get to light the (Hanukkah) candles, too (at sunset),” he said. Elia seemed to agree with her little brother’s favorable opinion of the family’s dual celebrations each year. “Yup. Good food,” she said.